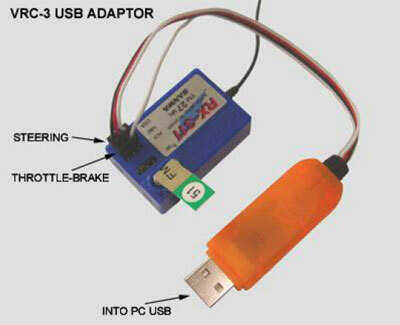 Introducing the VRC-3 USB adaptor. This is the 3rd generation of the popular VRC adaptor: VRC-3. It is specially developed for VRC for optimized performance and user friendliness. The VRC-3 adaptor does not work with 2.4Ghz systems. Simply plug the 2 servo connectors into the receiver: the 3-lead into the steering slot, and the single lead into the throttle-brake slot. Make sure to plug the servo connectors in with the white lead in the same position as your servo cable plus in. A flashing red LED inside the adaptor indicates that the adaptor has been connected correctly. A continuous dimmed red LED indicates that the servo connectors should be plugged in the other way around. When connected correctly and with the USB plugged into your computer, the device will be recognized by Windows as a standard HID device (Human Input Device), and will be identified as 'VRC USB adaptor 3'. No special drivers need to be installed. The VRC-3 USB adaptor works independent of the brand or frequency of your transmitter as it only uses the standardized servo output signals and translates these to the standardized game controller input using the HID protocol. The VRC-3 therefore works with all 27-40-53-72MHz. Futaba PCM mode is not supported. If the radio set has different modulation modes, use FM or PPM modes only. It does not work on receivers for digital servo's. The receiver is powered through the VRC-3 USB adaptor which receives its power from the USB port of your computer. Do not connect a receiver battery pack. To calibrate check this article: How do I calibrate my controller?